Well grown gentle and patient exhibit. He has an attractive inverted blaze of white covering his nose and whisker pads. Expressive bright green eyes. Strong white legs, White under body and an unusual white ‘collar’ around the neck. The back of the body coat is black as is Alfie’s long tail. Dense well groomed body coat, the black really glossy. He is so gentle and relaxed. Alfie (our farm cat) had a red card day. 1st in the Open, 1st in The Royal Canin, 1st a Side Class and 3rd in 2 Side Classes. 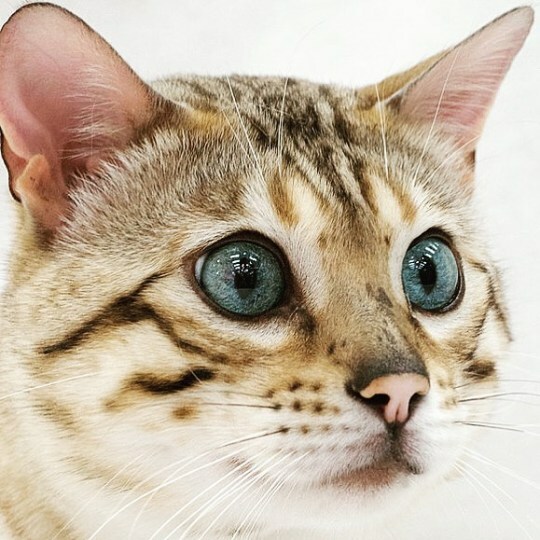 He now has his 3rd Master Cat Certificate. 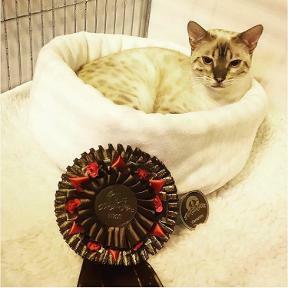 Bertie (neutered male Bengal) came 4th in his Open Class and 1st in a Side Class.